The nation’s first memorial to victims of lynching has drawn more than 100,000 visitors in its first three months – far exceeding some earlier estimates. The National Memorial for Peace and Justice in Montgomery shares stories about some of the 4,400 black people slain in lynchings and other racial killings between 1877 and 1950. 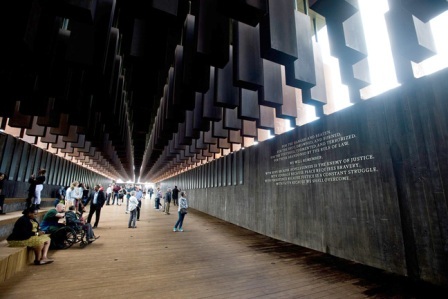 The names of those killed, if they are known, are engraved on 800 steel columns, with copies to be adopted by each U.S. county where lynchings happened. The Montgomery Advertiser reports that some visitors have been part of large groups. About 100 community leaders visited last month from Charlottesville, Virginia, where whites and blacks clashed in the streets and a woman was killed by a motorist during the “Unite the Right” rally last summer.